Fresh, bright greeting cards featuring unique designs for birthdays, holidays, weddings and other special occasions. About Me: My name is Polly. 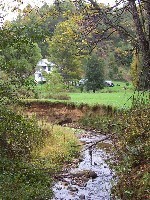 I live in an old white farmhouse on the banks of a noisy little creek in the mountains of Virginia. The singing and chattering of the water keeps me happy and creative. In addition to the dogs and cats we have Nubian dairy goats, rabbits, chickens, ducks, horses, doves, pigeons and pigs. I'm inspired by the trees and the birds, our menagerie of animals and all the beauty that surrounds our farm. Hello and Welcome to Crickwater Cards! I hope you enjoy your visit and find the card you are looking for. I enjoyed looking through your store Polly...absolutely beautiful cards! You have beautiful and playful designs. Lovely work and a wonderful selection. A beautiful selection of cards. Your style is so pleasing to the eye! Marvelous work! I love your style! Keep up the wonderful work. Your are very talented. Your style is new and refreshing. Gosh....I can't believe how beautiful your store is!!! Just wonderful! Your store is wonderful, genuine and very happy. Great style (love the black specked hen). Good Luck to you! Your cards are enchanting...much like your life sounds! Your cards are just plain lovely! I especially like your "Own Little Farm" card. Best of luck with your card store!